Net ball Goal Keepers tend to be tall and rather physical players who are always ready for action. Considering that they are the last line of defense, they play a most pivotal role in the game. They are responsible for guarding the defensive third and the goal circle. Their primary job of this Netball position is to stop the Goal Shooters from scoring points. Goal Keepers must always be on alert as it is part of their duties to intercept passes and retrieve rebounds off of the goal posts. Goal Keepers are also responsible for the goal line throw-ins. 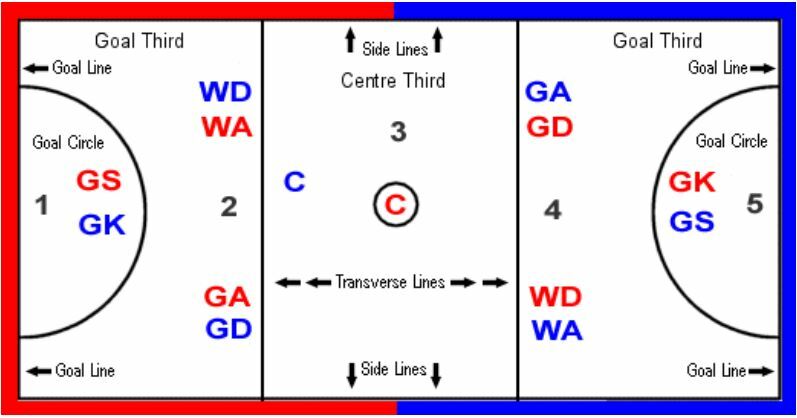 Goal Defense (GD): The Netball Position of Goal Defender is responsible for guarding the center third, goal circle, and the defensive third of the Netball field. It is their job to get the ball out of the danger zone and keep the opposing team from scoring. Goal Defenders must guard the Goal Attacker on the other team. They should have quick reflexes to allow themselves the opportunity to block passes and kicks and return the ball to their team’s offensive players. Goal Defenders work closely with the Goal Keeper. Wing Defense (WD): It is important for a Wing Defender to be focused as it is their main job to prevent the opposing team from getting the ball into their goal circle. They are responsible for guarding the center and defensive thirds of the field, as well as, the opposing Wing Attack. The Netball positions of Wing Defenders are expected to intercept passes and return the ball to their offensive players. Center (C): The Center is allowed to move anywhere on the field except the goal circles. They play on both defense and offense and are expected to bring the ball away from the defensive positions and towards the offensive positions. The Center is quite literally the center of the team and thus is expected to have quick speed and ingenious moves. They are able to restart the game after a goal has been scored by passing from the center circle. Centers are expected to be quick, and therefore, tend to be smaller in stature. Wing Attack (WA): The Netball position of Wing Attackers are crucial to the offense and are considered to be the playmakers of the game. They are responsible for getting the ball to the shooters, who the, in turn, score on the opposing goal. Wing Attackers are expected to have honed their passing and interception skills; therefore, good footwork is critical. They are allowed to move about in the center third and attacking areas but must stay out of the defensive third and goal circle. Goal Attacker (GA): The Goal Attacker’s primary purpose on the field is to get and pass the ball to the shooter so that they may score. They are allowed to play in the attacking and the center third but must not enter the goal circle. The Goal Attacker is expected to have both passing and shooting skills, as they can shoot the ball if the Goal Shooter is being heavily defended. Goal Shooter (GS): The primary job responsibility of the Netball position ofGoal Shooter is to score points for their team. They are only allowed in the attacking third of the field and the goal circle. Goal Shooters are expected to have quick reflexes and must possess the ability to receive passes and get shots off quickly. They tend to be amongst the tallest players on the field.